The official poster has been unveiled for the 54th Annual Mobil 1 Twelve Hours of Sebring. Created by Roger Warrick, the poster features action at Sebring’s famous hairpin turn as sunset approaches. The Porsche RS Spyder and the new diesel-powered Audi R10, making its world competition debut at Sebring, are among the featured cars. “Artist Roger Warrick has captured the atmosphere and excitement of Sebring in this scene,” stated Sebring Raceway President and General Manager Tres Stephenson. “The hairpin is probably our most historic turn, and sunset is truly a dramatic time at Sebring. The Sebring poster is a sports car racing tradition, dating back to the first 12-hour classic in 1952. Many of the posters are highly collectible, with noted artists such as Michael Turner, Simon Ward, Dion Pears and Lee Self creating the official poster art in past years. Porsche of Naples, through its support of the Sebring Sports Car Racing Museum Fund, is the official sponsor of the artwork. The original painting will be on display at the Porsche of Naples showroom later this month, then will be auctioned at the Sebring Hall of Fame induction ceremonies on Friday, March 17, at the Four Points by Sheraton Chateau Elan. 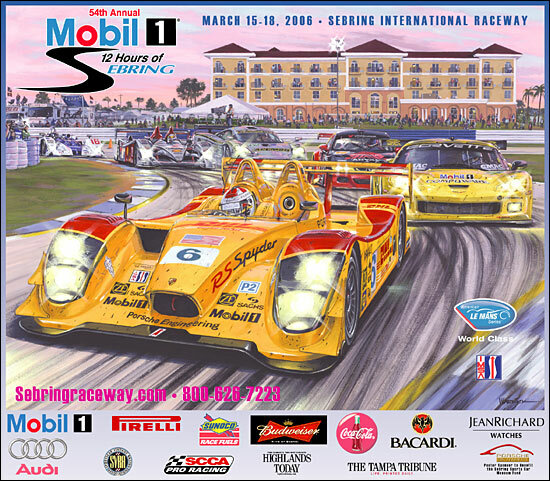 The limited-edition print of the Sebring 2006 poster will be available for purchase at sebringraceway.com. Tickets to the 54th Annual Mobil 1 Twelve Hours of Sebring are currently on sale at advance-purchase prices through Feb. 28. For more information visit www.sebringraceway.com or call 800-626-7223.